pattern에 변화를 줄 수가 있습니다. 시료를 몇 일 동안 보존 할 수 있습니다. CellCover는 enzymatic hydrolysis를 shielding molecules로 안정화합니다. CellCover의 또 다른 장점은 핵산이나 단백질의 2차, 3차 구조가 유지되게 하기 때문에, CellCover를 이용한 조직이나 세포들은 in-vivo 상태와 같도록 DNA, RNA 및 protein을 유지시킨다는 것입니다. CellCover로 처리한 시료는 실온(25 ℃)에서 하루, 4 ℃에서 4 주까지 저장 할 수 있으며, 시료는 면역염색, flow cytometry, in situ hybridization 등에 적용 할 수 있습니다. freezing is that you can perform additional molecular analysis on cells already analysed on morphological or molecular level: DNA, RNA (with high RINs) or protein can be isolated for subsequent applications after initial IHC, ICC or FACS analyses. applying commonly used standards procedures) - and there is no need to hurry! Bioanalyzer. 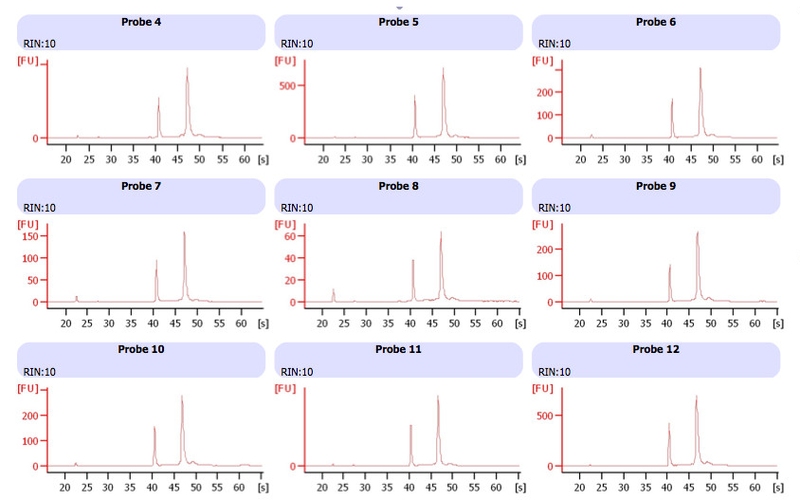 Results show a stable RIN(RNA integrity number) value of 10 from first till last day of the time course. (Left) CellCover fixed cell on glass slide. Positive IHC signal for formalin-sensitive Epitope Vimentin. (Right) Formalin fixed cell on glass slide. No IHC signal for formalin-sensitive Epitope Vimentin. (Left) Primary cells shows high cellular integrity by FACS analysis. (Right) Gated cells (R1) with red and green fluorescence signals.